The parable of the lost sheep tells us that even if His sacrifice was needed for one lost soul, God would have still sent Him. But we all needed His death, and more importantly, His resurrection. Christ was dead, wrapped in burial cloths, closed into a tomb, and guarded. Daytime went dark, and the earth shook with distress. He who was the purest of truth, love, and peace, was dead. While there is speculation about what happened to his soul during those three days, perhaps he did descend into hell to do time for those he had died for. Those who would accept Him as their Savior, by-passing the hell they deserve. I don’t really know. The bigger point is that three days later, He walked out of His grave. He beat the one thing man can’t do on his own-a final death. This Holy Week, may we live expectantly. May we live a celebration over our own final death, and the joy that we will someday walk with our Savior in paradise. I had no idea what to expect. For once in my life, I had slowed down enough to really hear what was being said. “You need to come; sooner, rather than later.” It wasn’t convenient. I had just returned from a work trip, I didn’t want to leave again. But the words stuck, “you need to come now.” Within 48 hours of returning from Minnesota, I was on a plane headed for Florida. She had only said that he had been sleeping a lot more lately, and not eating much. Dad was 92 years old. To be honest, over the last few years, I noticed him slowing down; the walker, the hearing loss. At the end of each of our last few visits (over a couple of years), I would wonder if it was the last visit. Truly hearing her words were a blessing, “You need to come now.” So, I went. I had three days with him. Not knowing much about how this end of life stuff worked, I didn’t realize that these were three of his last seven days. He did sleep a lot. But when he was awake, we shared some extraordinary moments. We had conversations about spiritual matters, about my work and my son moving to college. There were times in our conversation when he, like many other times, was strong in his opinion. It was good to see the spark still come from a weakened 90-pound man. He was still in there. Months ago, his distinctive voice, that I pray never leaves my memory, diminished. His deep but friendly voice carried the spirit of what he believed in his heart. 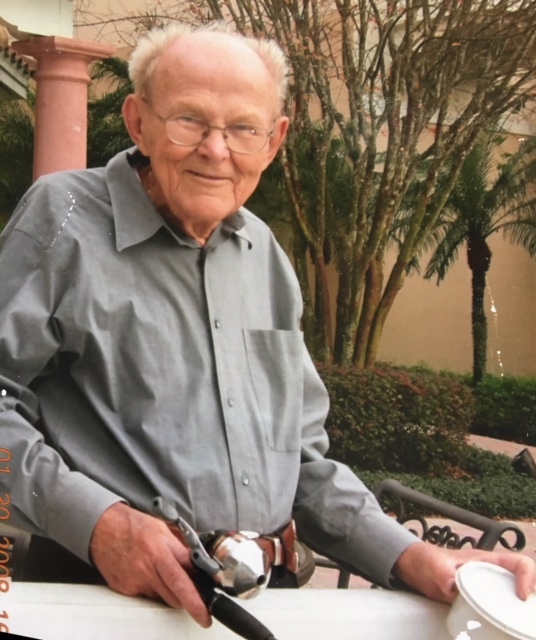 Dad was kind-hearted and believed in helping where and when he could. He believed in getting a good education and being productive. He shared often that everyone has something to contribute. He had a big spirit, but a humble heart. I remember him telling me once, “if you have something you don’t need, but someone else does, you should give it to him. That thing isn’t doing you a bit of good but could make a difference to the next guy.” Dad was full of what he called his little “sermons.” While probably too many times in my life I didn’t listen, sometimes I did and would decide for myself if that was a belief I would adopt. Dad always had a notebook of paper and a pen. He would be doodling or designing. His mind was moving, even when he was sitting. He left the writing to me, although during the years he lived in Saudi Arabia, he wrote some of the most wonderful letters. During our recent visit, when he was quiet, I imagine his mind was still moving. He knew he wasn’t long for this world. His health had failed to the point of having hands too swollen to hold a pencil. His eyes could no longer see to peruse books or magazines. He shared that he no longer had a purpose. Like so many other times in his life, dad didn’t realize that even in those last seven days, he had a purpose. Three of those days at least, his purpose was to slow his “middle daughter down” in order to connect one last time, to appreciate not in some naive way, her dad. For all of his imperfection, he was my dad, he brought me into this world. He loved me. Like many other parent/child relationships, we had seasons of distance. But those seasons have faded over the last 30 years, to come to the blessing of an adult relationship. One that allowed me to appreciate and love dad for who he was and what he brought to our relationship. Sitting in his recliner that weighed twice what he did, his eyes were crystal blue. I sat close to save his voice from straining, and to ensure I could hear him. He recalled stories of years past with such detail that I didn’t even remember. Other times, he would just look straight into my eyes. We connected without words. He was my father. And he was fading from this world into the next. He was being called home. His effervescent spirit was calm, he had peace. Thank you, dad, for your spirited example of living. May our lives honor that through continuing to be life-long learners, kind-hearted people, and productive citizens. This week, many of us are preparing our hearts for Easter celebration. Prior to the ressurection festivities we can’t ignore the events leading up to it. Jesus was crucified. It was the end of his human existence. While we usually focus on the fulfillment of prophecies, consider for a moment Him being fully human and fully God. He served as the perfect sacrifice for salvation. Tonight I was enlightened to the completion of Christ’s human purpose on earth. Jesus had earthly parents. While his earthly father, Joseph, more than likely died earlier, this left Jesus as the oldest male in his family. He was responsible for his mother, Mary. The Gospel of John recounts an endearing moment with Jesus and His mother. While hanging naked and humiliated on the cross, Jesus is concerned about His mother. In John 19:25 – 27, Jesus entrusts the care of His mother to John (the disciple who He loved). In the final minutes of His eternal purpose, verse 28, Jesus says that He is thirsty. Spirits don’t get thirsty. In His human need, he is given sour vinegar. With all prophecies fulfilled, Jesus died. He surrendered His life. Just like each of us will someday do. Jesus’ eternal purpose was more important, but what makes Him relatable, was His human existence. As citizens of the United States we are all given rights to our opinions and lifestyles. We have the right to express our opinions in a peaceful manner. We send representatives to congress on both the state and federal level. While their jobs are to represent what is best for all citizens, it is impossible for them to create laws to change the hearts of the people. Let’s take gun control as one example. I had a person tell me that “no one NEEDS to own an automatic weapon”. Perhaps. But that’s not the point. As law-abiding citizens, we have the right, if we WANT, to own an automatic weapon. Guns of any kind are only as dangerous as the evil in the hearts of those who hold them. No law can change that. Sometimes I wonder about those who protest certain legislation. Does their protest really solve the root problem? Are they communicating about a change that will make a real difference? Or are you just marching, carrying signs and making a bunch of noise? Maybe the answer is yes to the first two questions. But sometimes I wonder — is there a better way to make a difference and not only change laws but turn hearts. Today is January 8th. The first week of the new year is over. It was a rough one for me as I promptly came down with a sinus infection of sorts and spent a few days in a fog. UGH, feel like I lost precious time. But I digress. Today, I had a chance to get my house in order and sit down to write my goals. As always, I pulled out last year’s. I’ve already confessed that not many of last year’s goals were accomplished. Instead of scrapping them, I read them and renewed in my heart that these were the three areas I wanted to accomplish something in — Financial, Mind & Spirit and Healthy Habits. Under each heading there are one or two specific goals. To strengthen my commitment to each category, I found Bible verses to go with each that would remind me of the goal. 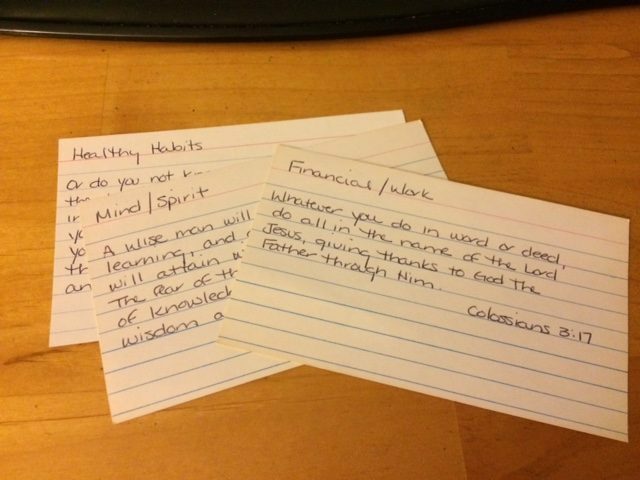 Each goal category and verse is written on a note card that I will see often. Perhaps as a person of faith, adding the scriptures to my goals will remind me each day that while I am human and may not always have the strength or discipline to stay focused, I serve a God who is bigger and is ready to help.